Looking for a cute cuddly puppy? Needing a new faithful friend? If so, your choice may well be a pedigree dog, of known ancestry and ideally with a Crufts champion in the line somewhere. But is that a safe bet anymore? Is success in the show-ring any sort of proof of quality? Are pedigree dogs being well-bred? Are they healthy? What are the experts saying? "The next hundred years look rather bleak for the pure bred dog industry unless dramatic changes are introduced. We have a problem which if not addressed and speedily rectified may destroy for all time many beautiful breeds of dog. All dog lovers share the blame for not acting..." This strongly-worded statement comes from a source not exactly renowned for publicity-seeking or prone to over-statement. It is one of the conclusions from a wide-ranging study into the state of the pedigree dog scene by four distinguished veterinary surgeons at the Ontario Veterinary College. The situation which they highlight has arisen because over the last hundred years or so, and for the first time in the two millennia of the unique man-dog partnership, dogs have become valued not for what they can do but for their appearance. Pedigree dogs can now have distorted limbs, deformed heads, ears which drag on the ground, absurdly short legs, stunted tails, sunken or protruding eyes, excessively long coats, superfluous teeth and over-wrinkled skin and actually be desired because of these exaggerations. They can be mentally unstable, brainless, savage and psychopathic, have a brief life span, be carriers of some of the 400-plus inheritable diseases afflicting dogs and yet still be admired for just two assets: their cosmetic appeal and their pedigree. 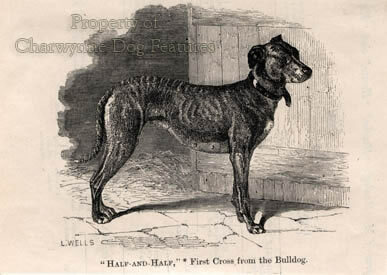 Such a fondness for disabled useless animals would have astounded our sporting ancestors, who dedicated their lives in many cases to obtaining functional excellence in breeds of dog, like the Labrador and the Cocker Spaniel, which subsequently became revered all over the world. As far as the sporting breeds, gundogs, hounds and terriers, are concerned this disturbing stage has been reached partly through today's sportsmen, with regrettable indifference, have betrayed the responsibility passed down to them. They have lazily passed the buck to a private monopoly, the Kennel Club. This despite the fact that as early as 1906, William Arkwright, the massively-authoritative Pointer fancier, was writing: "...degeneration in him (i.e. the pointer) was a necessary consequence of the methods of the Kennel Club. 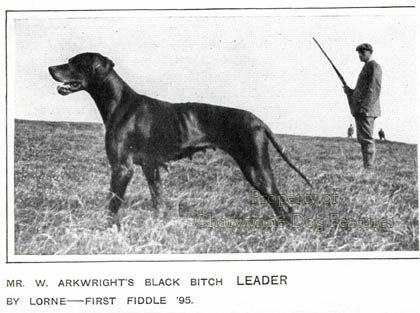 The interests of this body, ranging from lap-dogs to life-savers, were far too wide to permit of its ever being a satisfactory legislator for the gundogs...For in a club like this, the shooting men must be in a minority, and laws will be passed that...will spell ruin for sporting dogs". Those gundog men, like Shirley the retriever man, who as founder members of the Kennel Club acted out of a desire to improve dogs must be turning in their graves. No one seeking excellence of performance from sporting and working dogs would question the good sense of selective breeding for function by knowledgeable fanciers. But an inflexible irrational reverence for the pedigree, whatever the quality of the dog, makes no sense at all. Which Pointer is the more valuable: one purchased in Ireland without papers which develops into a field trial winner or one with papers and disabling upright shoulders which wins the gundog group at Crufts? Does a win at Crufts have the great distinction which the fawning TV commentators at that show would have us believe? Here are a few judges's critiques from that showpiece event: firstly on Great Danes..."I did frankly wonder how some of the dogs there had even managed to win a 1st prize!...the lowering of the general quality of the hounds coming into the ring is only a long continuation of the process that respected senior all-rounders and our own experienced breed specialists have been warning us about for years." Secondly on Deerhounds: "I was VERY disappointed in the quality...How do they qualify?" And thirdly on Airedales: "I am sorry to say that the anatomic structure of most of the Airedales shown in the ring, even if they were champions, was more or less incorrect". But gundog devotees have no cause for complacency either; here are some phrases from the Crufts' judges's critiques on their breeds: Labradors - "The true Lab head is becoming increasingly rare...movement that was true was also sadly lacking...Regrettably I cannot understand why a few qualified at all". Cocker Spaniels - "...it was disappointing to find that there was often an underlay of dogs which were upright in shoulder and had poor movement". Irish Setters - "I found quality in depth lacking and the movement was on the whole very bad". Three gundog breeds that can't walk properly - what kind of quality is that in a creature intended to be functional? In the sporting field however, function rather than purity of breeding is pursued. 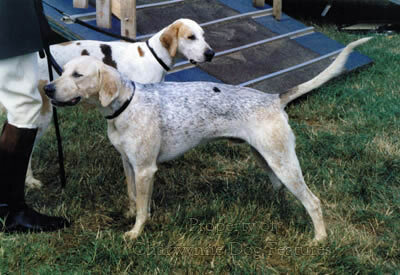 In the past, Foxhounds have been crossed with Greyhounds, Greyhounds with Bulldogs and both Labradors and Pointers with Foxhounds. Today's hunting bassets have been outcrossed with Harriers to obtain a more functional hunting dog. Such a step was advocated by the greatly-respected early bloodhound breeder, Edward Brough, who recommended an outcross in every fifth generation. Bloodhounds in working packs have been outcrossed with Dumfriesshire Foxhounds (now lost to us following the Hunting With Dogs Act) to minimize "bloat", reduce head size and avoid sunken eyes. What is the value of pure breeding when it isn't working? The pedigree show basset suffers from eye and eyelid diseases, arthritis from bent legs and distorted feet, ear problems due to over-long and over-floppy leathers and is susceptible to back injuries and slipped discs from a hyper-elongated spine. But they still become Kennel Club recognised show champions. Less than half the recognised KC breeds have a breed health committee, only 27% have a health/welfare coordinator and only around 20% of all breed clubs have some form of health surveillance in place. That surely is unacceptable. These breed clubs decide the future of each pedigree breed. Is it true that 70% of collies have CEA? Do 50% of Cavaliers have heart trouble? Are 70% of Dobermanns carriers of Von Willebrand's? Will all small white breeds one day suffer from 'white dog tremor syndrome'? Why do all three varieties of Poodle have a genetic predisposition to idiopathic epilepsy? Is the problem of cataracts increasing in Australian Shepherds? What are the underlying causes of calcium oxalate uroliths in five different Toy breeds? Is Cushing's Disease becoming more prevalent in older Boston Terriers? Is overgrowth of footpads going to become a future problem in Kerry Blue Terriers? Are there any Boxers free of heart murmurs? Veterinary surgeons acknowledge that there is no official way to discover which diseases are prevalent in companion animals. If that is so, and breed clubs don't care, how on earth can we fight disease in the domestic dog? The deliberate seeking of great size in some breeds also causes needless disabilities. Of what use is a 20 stone Mastiff? That fine sporting dog, the Deerhound, has to achieve, in its KC-approved breed standard, a minimum height of 30" at the withers. 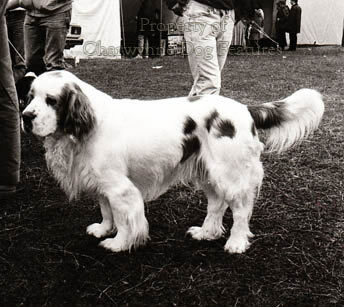 In its infancy as a pedigree show breed, the specimens of this size were only passed on to exhibitors because they were too cumbersome, uncoordinated and unsuccessful as hunting dogs. Breeding for giant size at the expense of physical soundness is foolish, as the Great Dane breeders of today are discovering. I can find no record in their boarhound ancestry of there being a requirement for these dogs to be at least 30" at the withers, as their breed standard also decrees. This breed is now one of the shortest-lived and least-robust, with innumerable bone problems, "Wobbler syndrome" and more recently glaucoma. Unlike this one-time German boarhound, our best bred hounds by far are the Welsh Foxhound and the Harrier, neither being patronised by the Kennel Club. But it is the gundog group which gives me the most anxiety. 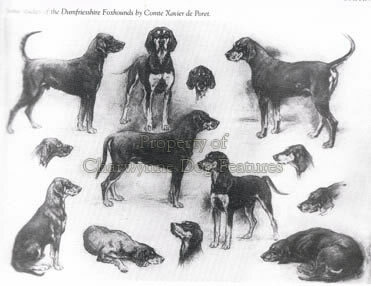 For these breeds were developed to a high level of excellence by discerning sportsmen such as Laverack, Llewellin, Boughey, Lords Sefton, Derby, Knutsford, Malmesbury and Lichfield and the Dukes of Kingston, Gordon and Newcastle. The latter's Clumber spaniel now has serious eye problems and unacknowledged hip deficiencies. Once favoured as a sporting dog at 40lbs, as the working variety still is, the show ring demands an ideal weight of 80lbs. Yet although an 80lb spaniel has never once been sought by sportsmen in the past, the KC knows better. The loss of type in our two most numerous gundog breeds, the Labrador and the English Springer, is also a matter of regret. The former, once valued for its stable temperament, now features high in the list of breeds displaying unwanted aggression. That lovely breed the golden retriever was found in an American veterinary survey to be the 7th most unhealthy breed and in the UK has featured in the top three for unwanted aggression. Such a rating for two fine retriever breeds developed by distinguished British sportsmen must be a cause of great concern to any future owner. The Labrador's KC-approved breed standard incidentally devotes over 40 words to the dog's tail but less than half that number to temperament. The English Setter was recently ranked sixth in the United States for its incidence of hip dysplasia. Cocker Spaniels can now inherit ectropion, entropion, a bleeding disorder known as factor X deficiency, progressive retinal atrophy, distichiasis and three different skeletal anomalies. Gordon Setters can now be afflicted by juvenile pyoderma, Chesapeake Bay Retrievers by hereditary cataract, Irish Setters by haemophilia A and Clumber Spaniels by hip dysplasia, with the second worst breed mean score and that from the small minority volunteered for scoring. Criminal cruelty to dogs is shamefully at an all-time high. But the rate of indirect cruelty through bad breeding, unwise blueprints and unchecked human whim simply dwarfs it. The Kennel Club is pleading with the government not to implement the European legislation banning harmful exaggerations in pedigree dogs, claiming that their amendments to the written descriptions to each breed will suffice. But these harmful exaggerations only became harmful to dogs because of the wording of the KC written standards, including changes promulgated by them. Voluntary hip and eye schemes (as set out in the KC's accredited breeder scheme) will never be enough. Banning an Irish Water Spaniel from the show ring after it had needed an operation for entropion is absurd when the dog can still be bred from. If such a rule were to be applied to chows, the breed classes would be empty! Where is the moral authority in the pedigree dog world ? It is morally reprehensible to allow dogs with faulty genes to be bred from; in Australia it is already unlawful, if done knowingly, as can happen here. Harmful exaggerations must now be bred out; simple outcrossing to a similar breed would suffice, with no eventual loss of type. The Canadian veterinary surgeons are merely telling us what we already know: if we do not act, at government level as well as breeder level, many admirable breeds of dog will be destroyed for all time. Over twenty European countries have signed up to legislation banning exaggerations in pedigree dogs. We have not; are they all wrong? These fine breeds of dog deserve rather more than our ruthless pursuit of trophies, ugly financial greed and lazy callous indifference over their fate.